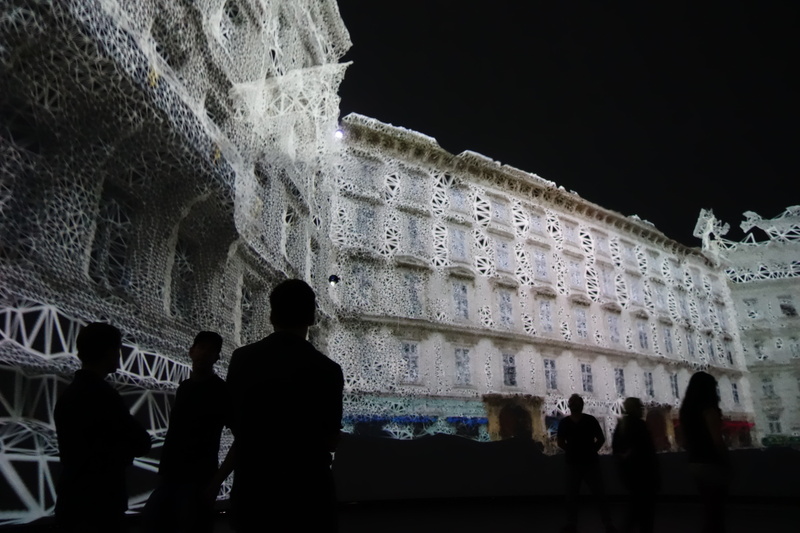 Murmuration was one of the outcomes from the E / M / D / L – EUROPEAN MOBILE DOME LAB for Artistic Research (http://www.emdl.eu/) partnership of European and Canadian cultural organisations funded by EU Culture Program. This post contains information and documentation on this project component. sounds or complaining noises, a mutter, the murmur of waves. 2: an abnormal whooshing sound emanating from the heart. 3: the mass cloud like flocking of starlings. Late Middle English: from French, from Latin murmuratio, from murmurare ‘to murmur’. A collective noun dating from the late C15th. Following the premier at the ix Symposium (http://ix.sat.qc.ca/node/422?language=en) on Thursday May 21 – 20:00 in the Satosphère, Liminal Spaces, Dream Collider and Murmuration were performed from May 26 to June 12 (http://sat.qc.ca/fr/emdl). E/M/D/L presents: Liminal Spaces, Dream Collider, and Murmuration, the culmination of a EU funded collaboration between Canadian and European partners. This research project was carried out through eight international residencies and is presented in the Satosphere of Montreal’s Society for Arts and Technology (SAT). 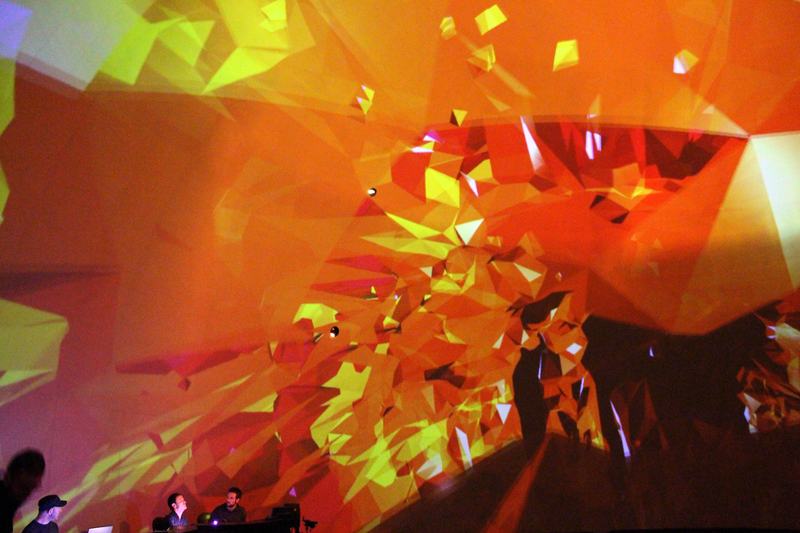 Articulated through the fulldome environment as an instrument to explore transdisciplinary forms of artistic expression, these experiments oscillate between performance, interactive installation and immersive event. We are made up of layers: the physical ones of skin and tissues, but also the intangible ones of history, tradition, images, and words. In the strata of sensations and accumulations of meanings, what strategies can be used to subjectivate such heterogeneous materials and find coherence among them? Where should borders be porous and where should they be strengthened? How can we let them breathe and allow them to change their contours? How to inhabit the threshold between two states, conditions, or regions – the transitory, the indeterminate? Sheltering layers of performance, interactivity and image, sound and text, the dome becomes the intermediary membrane between inside and outside, as it is explored and pierced through at the limit of palpable space. Through an interactive journey in the narrated dreamland of crystallized daily scenes, Dream Collider questions the intertwined states of diverging oneiric ideas, the raise and collapse of these subconscious mind constructions, and the iterative processes leading the exploration of self-generated worlds. Initially created with the intent of expressing grammatical results issued from artistic research in the field of immersion, this dome installation highlights the relation and cohesion of physical and virtual spaces, and the place of the user as a living presence in between the layers of this multi-perspective narrative. Abstract collisions, premonitory visions or interneuronal recovery fluctuations; dreams have always been intriguing and are haunting our nights’ and days’ perceptions. Organizations: Society for Arts and Technology [SAT], Montreal, Canada. Participants/Collaborators: Derek deBlois, Bruno Colpron, Sébastien Gravel, Jean Ranger, Dominic St-Amant and Louis-Philippe St-Arnault. Murmuration [muttering of low, indistinct, whispers / abnormal heart sounds / mass cloud like flocking] is a series of trans-scalar and recursive transitions from the imaginary to infinity: i∞. 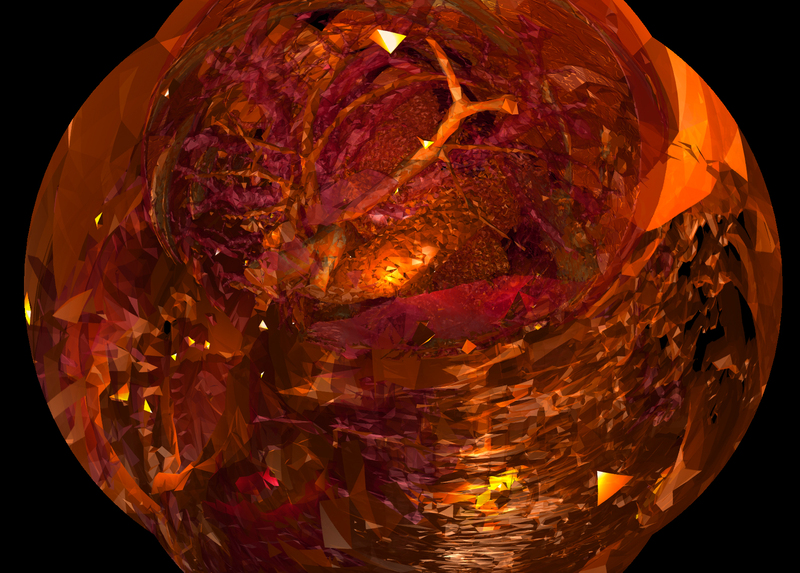 Constructed from bio-imaging technologies and modeled fractured architectures, the low-poly-aesthetic of murmuration navigates its audience through playful interaction with particle swarms of digital detritus and real-time manipulation of virtual/physical audio-visual objects and the environmental experiences afforded by their continuously transforming arrangement. Algorithms of repulsion and attraction maintain the cohesion of nano/molecular landscapes harvested by atomic force. Bio-forms, like artificial organs, and boney architectures, temporarily seem to come to life, create cavities and cavernous voids, conjuring uncanny atmospheres of elation, intrigue and awe. Laboratory of New Technologies in Communication, Education and the Mass Media (UoA NTLab), Athens, Greece / i-DAT (Institute of Digital Art and Technology), Plymouth, U.K.
Phage shell fabrication: Iain Griffin. 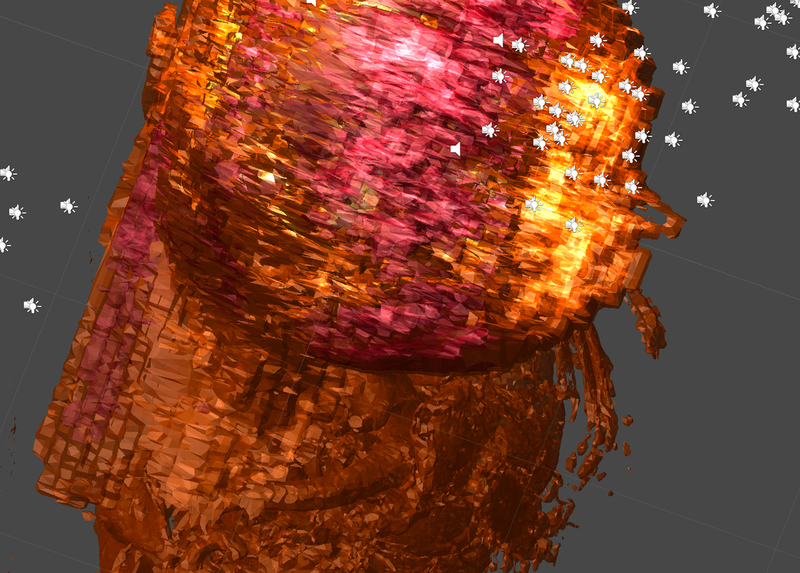 Swarming ‘Phage’ [particles/fragments/epithelium/boids] traverse the three domains, providing a focus for audience interaction and navigation. A murmuratiuon of Phage sweep noisily through the hollow space. Access to each domain is unlocked by interactions through the physical remains of fallen Phage. This detritus (control and feedback devices) is scattered around the floor of the SATosphere. The Trans-scalar recursive spaces are reminiscent of biological architectures, planes and volumes reconstructed, nano/molecular landscapes harvested from Atomic Force Microscopy, skin from surface scans and deep structures and cavities from MRI scans. Radical shifts in perspective between these states of scale, the vast cavernous spaces and towering structures create uncanny atmospheres of elation, intrigue and awe. Micro architectures emerge as structural entities hovering the void, nestling between abstract biological forms, like manufactured organs. Their structures are pliable and noisy, wailing and screeching like dysfunctional machinery. They dominate the view until they absorb the viewer. 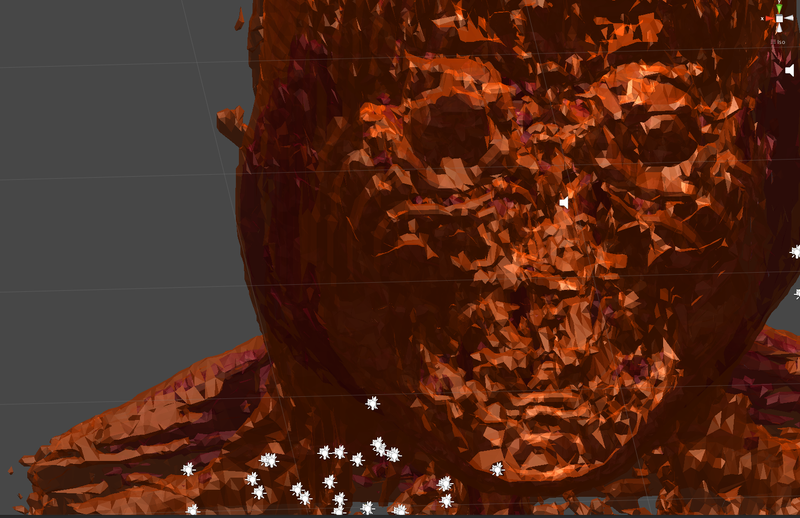 Now the inside out their forms become totally immersive to the point of transition back into the void. Other larger scale assemblages of fractured phage-like objects, barely held together by semi-transparent scaffoldings, afford playful interaction with members of the audience and as they rotate and translate in unpredictable ways, they emit sounds and after a while are ‘ελκονται απο την αρνητική βαρύτητα and move onto the ominous global kelyfos enclosure of the “world”. Ultimately, the assemblages are dismantled to reveal the recursiveness of the movement within/through these consecutive worlds; one world nested into the other and revealing themselves to the audience in a recursive sequence..
Fluttering and buzzing in fits and starts of attraction and repulsion, the swarming Phage slowly become the thing they were once part of, fragments now form the whole. The swarming Phage begin to converge, forming new figurative structures which congeal and begin to rise, escheresque from the abyss. 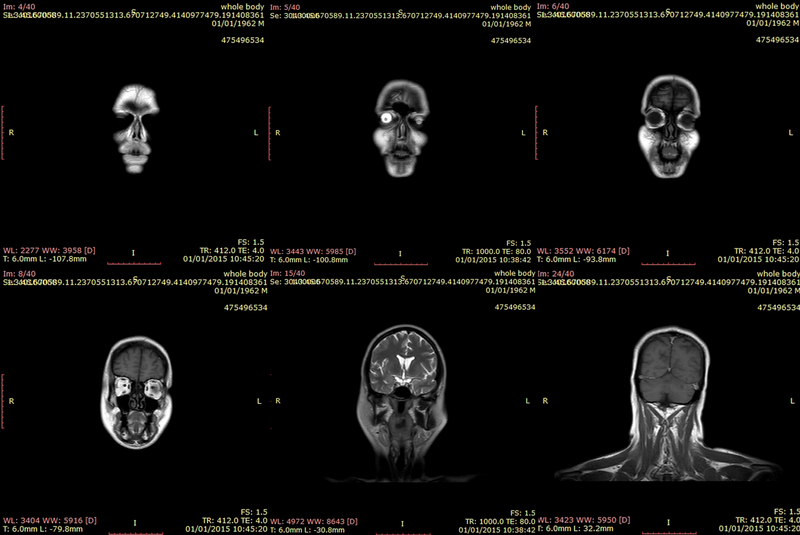 skin from surface scans… deep structures/cavities – MRI scans: vast cavernous voidsand towering structures conjuring uncanny atmospheres. Fractured architectures… interactive and noisy, reconfiguring fractured forms of diverse scales, anchored to the seemingly existent scaffoldings fluctuating between inner and outer spaces. Converged Phage Figures… the swarming Page coalesce into rising figures in partial transition partial form. The Rise: Dante/Escher-esque Concentric Circles of…. Part evolution, part escape, the slow parallax rise through the reformed bio-architectures, spiral across the universe. From the myriad experiments and technical investigations the following instances provide a non-exclusive substrate for murmuration. 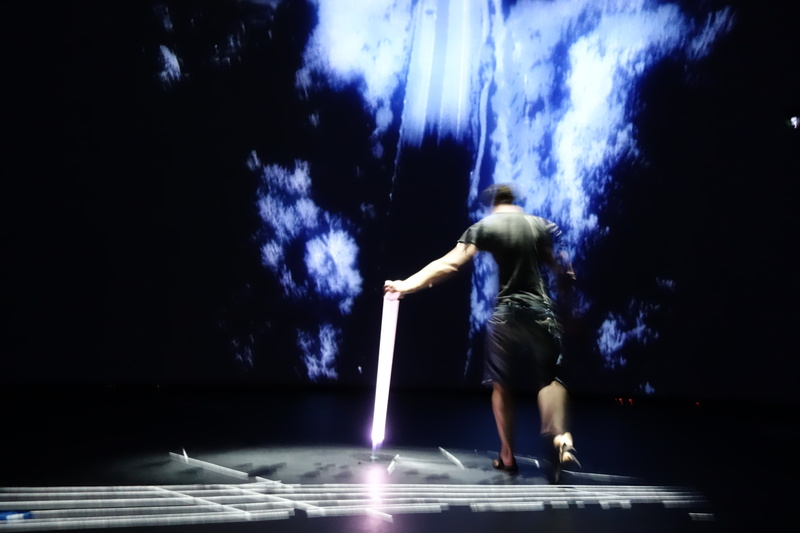 A particular output of this collaboration was the development of ‘Phage’ technologies, collaborative physical instruments that allow the manipulation of virtual objects within the projected dome space. These technologies are now flowing out of the Fulldome space and are being deployed within cultural and heritage institutions as a means of accessing new knowledge from museum artefacts, enhancing audience engagement and constructing a shared heritage through crowd participation. Each physical Phage has its own characteristics and behaviours they: illuminate, listen, mutter, shudder, reveal inner recursive domains. They are instruments for connecting across the membrane of the fulldome into dimensions beyond. This reach beyond the dome surface cultivates navigation through the recursive spaces and interaction with the dynamic evolving architectures. In the case of one of the environments, they are instruments for controlling the translation, rotation and corresponding evolution of the audiovisual fractured objects which surround the audience in the dome. Phage: Weishaupt – the illuminated one. Weishaupt’s radiant DNA seeps across the other Phage, providing general enlightenment. Audio responsive pulsating optical communication. Glow. Technical: Internal lights and LED’s create a glow which responds to sound levels. Reference: Weishaupt was the founder of the original Bavarian Illuminati. Phage: Orare – the confessor. Orare listens, the confessions of others feed the environment, the murmuration of crowds. Technical: Bluetooth transmission of recordings to the mixer. Reference: Orare is latin for worship but also the origin of the oratory or confessional. Phage: Uto – the muttering one. Uto the muttering oracle, the babbling Phage. Technical: Embedded speaker, possibly live audio feed or looped recordings. Reference: Uto, the first Oracle (Egyptian). Phage: Raptus – Phase state of transition. Technical: constant variable vibrations and gyroscope . Reference: Raptus, root of Rapture, Latin for carrying off. Phage: Sanctorum – the hollow one. Sanctorum, “my god, it’s full of stars” – the inner sanctum, a portal to another world, the recursive space physically bound in stasis inside the guts of the Phage architecture. 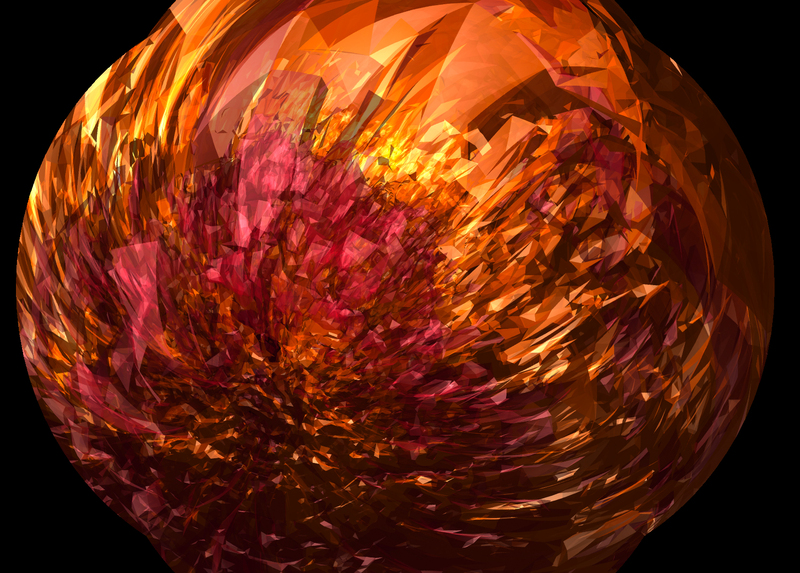 Technical: Hollow, recursive space with embedded screen, illuminated and animated. Central to the navigation of these trans-scalar recursive architectures is the transitions between states, domains, architectures and sequences. Phage swarms as they flock around the architecture. The start of murmuration, from the darkness and the fall of the physical Phage to the floor. Bio-architectures: AFM, surface scans and MRI scans. The spatial shifts that take place between these spaces and surfaces. Micro-macro architectures: to/from the bio-architectures and inside/outside. The transition from the space which contains them to view and interact with them but also the transition inside. the environmental acoustics of the Rise circles. With thanks to the MRI Department, Derriford Hospital, Plymouth Hospitals NHS Trust for the full body MRI Scan.